The Cyclospora outbreak has now sickened 598 people, according to the latest update from the CDC. Forty people have been hospitalized, and there have been no deaths. Public health officials do not know if all of the illnesses are part of the same outbreak, although the outbreak in Iowa and Nebraska has been linked to a food service salad mix. Taylor Farms de Mexico salads, sold at Olive Garden and Red Lobster, are linked to the Cyclospora cases in those states. 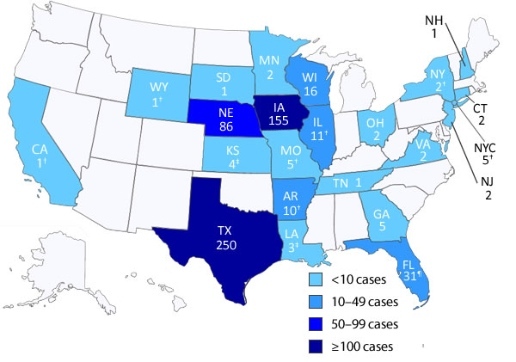 The outbreak by state is: Texas (250), Iowa (155), Nebraska (86), Florida (31), Wisconsin (16), Illinois (11), Arkansas (10), Georgia (5), Missouri (5), New York City (5), Kansas (4), Louisiana (3), Connecticut (2), Minnesota (2), New Jersey (2), New York (2), Ohio (2), Virginia (2), California (1), New Hampshire (1), South Dakota (1), Tennessee (1), and Wyoming (1). Some of these numbers include cases that were acquired out of state, and may include one travel-related illness. The CDC is issuing advice to consumers. They say that people should not stop eating fruits and vegetables, as they are part of a well-balanced diet. Wash all fruits and vegetables thoroughly before eating, cutting, or cooking. It’s important to scrub firm vegetables and fruits before cutting, since any parasite or bacteria on the skin can be transferred to the flesh while cutting. Refrigerate cut, peeled, or cooked fruits and vegetables as soon as possible, or within two hours of preparation. This is now the same as the advice for meats, cheeses, and eggs. The CDC also states that “prewashed” produce does not need to be washed again at home. We’ve told you before about the controversy over washing or not washing prewashed bagged salads. While washing can remove pathogens, it can also add them if your kitchen is not sterile (and whose is?). If you develop symptoms of cyclosporiasis, which include watery diarrhea that can be explosive, weight loss, loss of appetite, stomach and abdominal ramps, bloating, nausea, fatigue, and vomiting, see your health care provider. Symptoms begin an average of 7 days after ingestion of the sporulated oocysts. More information about the symptoms and treatment of a Cyclospora infection can be found at the CDC site.